I've been working at Apigee since September 2013 and one of the things I love most about my new job is the fact that I'm actively contributing to open source again. I'm working on Apache Usergrid (incubating), an open source Backend-As-A-Service (BaaS) that's built on the Apache Cassandra database system. Apigee uses Usergrid as part of Apigee Edge (see the Build Apps part of the docs). Apigee contributed code for Usergrid to the Apache Software Foundation back in October 2013 and Usergrid is now part of the Apache Incubator. The project is working towards graduating from the Incubator. That means learning the Apache way, following the processes to get a release out and most importantly, building a diverse community of contributors to build and maintain Usergrid. One on the most important parts of building an open source community is making it easy for people to contribute and and that's why I submitted a talk to the ApacheCon US 2014 conference (April 7-9 in Denver, CO) titled How to Contribute to Usergrid. The talk is intended to be a briefing for contributors, one that will lead you through building and running Usergrid locally, understanding the code-base and test infrastructure and how to get your code accepted into the Usergrid project. Why would anybody want to contribute to Usergrid? I'm in the process of writing this talk now so suggestions and other feedback are most welcome. Building an Open Source J2EE Weblogger: As a Java developer, you should be aware of the tremendous wealth of open source development software that is available for your use -- even if you have no desire to release any of your own software as open source. In this article, I will introduce you to some of the most useful open source Java development tools by showing you how I used these tools to develop a complete database-driven Web application called Roller. Roller fits into the relatively new category of software called webloggers: applications that make it easy for you to maintain a weblog, also known as a blog -- a public diary where you link to recent reading on the Web and comment on items of interest to you. The Roller Web application allows you to maintain a Web site that consists of a weblog, an organized collection of favorite Web bookmarks, and a collection of favorite news feeds. You can define Web pages to display your weblog, bookmarks, and news feeds. By editing the HTML templates that define these pages, you have almost total control over the layout and appearance of these pages. Most importantly, you can do all of this without leaving the Roller Web application -- no programming is required. These days, Roller isn't really thriving as an open source project. Wordpress became the de facto standard blogging package and then micro-blogging took over the world. There are only a couple of active committers and most recent contributions have come via student contributions. Though IBM, Oracle and other companies still use it heavily, they do not contribute back to the project. If you're interested in contributing to Roller or becoming part of the Apache Software Foundation, then Roller needs YOU!. Survey says 80% of New Relic's Java customers choose open source app servers over expensive bloat-ware. Server wars: Open-source Java vs Weblogic and WebSphere | Software, Interrupted - CNET News: Overall, it's not surprising that users who are deploying their applications to the cloud are more likely to use open source, if for no other reason than that licensing is far simpler. Additionally, there are Amazon Machine Images (AMIs) available for most open source stacks, making it very easy to choose open source over a traditionally licensed application server. In my quest to get Roller running on the latest in Java EE servers, the last server I tacked was the WebSphere Application Server. Unlike Glassfish and JBoss, WebSphere's Java EE 6 offering is not available in final form yet. Java EE 6 support is coming in WebSphere 8. So, for this exercise I used the WebSphere 8 beta, which was made available in July 2010. In this blog I'll describe how I approached the problem what I learned along the way. In my quest to make Roller work on Java EE 6, the first server that I decided to tackle was Glassfish 3. In this blog I'll describe how I approached the problem and what I learned along the way. Roller uses JPA for persistence and specifically the Apache OpenJPA implementation. I knew that GlassFish uses the EclipseLink JPA implementation and I suspected that there would be JPA portability problems, so I decided to run Roller's JUnit tests against EclipseLink JPA. I wanted to find and fix those problems before even touching GlassFish. The tests ran and there were many JPA related failures and errors, most due to differences in the way that EclipseLink handles bi-directional relationships and the use of unmanaged objects. I was a Maven hater and resisted it for a long time but over the years Maven has gotten much better, it's well supported in IDEs and as far as I can tell, Maven has replaced Ant as the de facto build system for Java projects. If you want new developers be able to easily build, debug and run your code via command or their favorite IDE then Maven is the way to go, and that's especially true for open source projects like Roller. That's why I spent a couple of weekends learning Maven and converting Roller's build process from Ant to Maven (ROL-1849). The process of conversion wasn't too difficult. Getting dependencies under control was a pain, but it believe it will be a one time pain and a worthwhile one. What took the most time was figuring out how to get Maven to start Derby, create the Roller tables and then run Roller's JUnit tests. Also, getting Maven's Jetty plugin setup to run Roller was a little tricky but hopefully also a one-time pain. The result is that Roller now uses a standard and well known directory structure, dependencies are managed and it's easier for developers to get started with the codebase. And once all that is done, the following commands will start the Jetty app server, start the Derby database and start Roller at http://localhost:8080/roller, ready for testing, experimentation, etc. I think that's pretty damn useful. Comparing Build Systems - Adrian Sutton concludes that Maven is too much work but "the consistency in how a project is built that the Maven project has brought to the Java would is absolutely revolutionary"
Maven in our development process - Sherali Karimov explains how Atlassian and says the need for Maven training is "the most important and most overlooked issue of all." Sonatype - The Maven Company. Founded in 2008 by Jason van Zyl, the creator of Maven. Offers training, support and the Nexus Professional repo manager. If you've been following Roller development you know that Roller 5.0 is on the way. Most of the changes in Roller 5.0 are "under the hood" so 5.0 won't make Alfonso's book obsolete. Except for a couple of pages in Chapter 5 "Spicing Up Your Blog" that need updated screenshots, I believe everything in the book applies to Roller 5.0 as well. I've attended every JavaOne since 2004, but this year I've got new job and a new conference to attend. This year I'll be traveling to Orlando, FL and attending the Rational Software Conference also known as #rsc2000 in the twit'o'sphere. I'm not going to be giving a talk, but I will be manning a demo pedestal and showing some of what I've been working on in my first couple of months at IBM: working on getting Rational Team Concert and other Jazz-based products to work well with Lotus Connections, IBM's social software suite which includes communities, forums, blogs, bookmarking, social networking and wikis (coming soon in Connections 2.5). Why would you want to use Team Concert with Connections? It's all about connecting developers to community, helping developers use social software tools to inform, share and collaborate with the wider community of people that support, manage, sell and use the software. The tentative plan that we've outlined for all (registered users) to see on the Jazz.net is all about making it easy to setup and integrate community infrastructure for a new software project. For example, wouldn't it be nice if, when you setup a new project in Team Concert you'd have the option of setting up an integrated Lotus Connections community complete with a project blog, discussion forum, wiki space and shared bookmarks? Shouldn't those blogs, forums and wikis be searched when you do a project search and shouldn't it be dead-simple to fire-off a blog entry or forum post to start a community conversation about a work-item or any other Team Concert artifact? We think so and we think that's just a start; there's lots more we can do. If you're going to be at RSC 2009, please stop by and say hi. I'll be on duty from 5-8PM on Monday and most of the day Tuesday. Whether you're there or not, if you've got ideas about developer tool and social software integration, I'd love to hear from you. Good news for ROME fans. Nick Lothian picked up the puck and is galloping towards the finish line (sorry, I'm terrible at sports analogies). I've gone and built some preview jars for the upcoming ROME 1.0RC2, ROME Fetcher 1.0RC2 and Modules 0.3 release. I've created source and javadoc jars as well as the normal jars - the idea being that I'll get them uploaded to some maven repository. If you have some spare time, please take a look at these and test them and let me know of any problems. Assuming there are no big issues found I'd like to do a proper release in a couple of days. Guess that means I should test Propono with RC2. Sun should give up on the desktop? Tim Bray: What Sun should do: Sun is going through a lousy spell right now. Well, so is the worldâs economy in general and the IT business in particular, but this is about Sun. This is my opinion about what my employer should do about it. Itâs easy to understand how our servers, CMT and x86, and the Solaris OS, fit into the Web Suite. All the software, including the HotSpot, GlassFish, and MySQL runtimes, needs to be obsessively tuned and optimized to run best in the context of the Suite. Obviously, the Suite will also include Ruby and Python and PHP runtimes, similarly tuned. All of Sunâs software tooling should have a laser focus on usability, performance, and ease of adoption for the Web Suite. I agree, but as a web geek I guess I'm pretty biased. For actual business apps, the kind that our servers spend most of their time running, the war for the desktop is over and the Web Browser won. I just totally donât believe that any combination of Flash and Silverlight and JavaFX is going to win it back. I can't say I disagree with that either. Cutting JavaFX and JavaME would be extremely tough and painful decisions, but somebody's going to make to make some of those. Looking at things from Tim's web-platform-only point of view, they make sense. Sun needs only enough client-side software to keep Solaris attractive to developers and to support great development tools on all the platforms that web developers love. Congratulations to the Apache Abdera team, who've just graduated to full Apache top level project status. The don't have the new site at abdera.apache.org up yet and they're still not quite at 1.0 yet, but this is a major milestone. They've got the best Atom format and protocol toolkit around, in my opinion. Next year there will be two CommunityOne events in the US of A; one in New York City on March 18 and the other, coinciding with JavaOne week in June 1 in San Francisco. Here's the call for papers link. The call closes on December 11. We demonstrated the Project SocialSite widgets in Roller at JavaOne, but we didn't show much other than just the basic widgets. We modified a Roller front-page theme to include a people directory, added a profile page for each user and slapped the widgets on the page. It was pretty rough, as you can see on the right, like our other SocialSite demo vehicles. Landing page: shows activities of your friends and groups, your inbox of social requests and place for you to update your status. This could be added to Roller's Main Menu page or to pages of the Front Page blog, which is my preferred option. 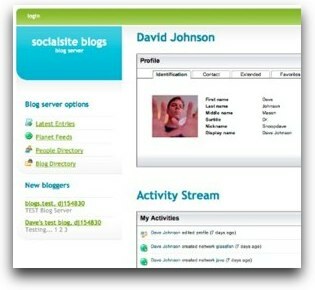 Personal profile page: shows your mugshot and the subset of your profile information that the viewer is allowed to see. Shows your activities and the OpenSocial gadgets you have installed. This could be done in the pages of each user's blog, which would give folks complete control of profile layout via page templates. Or I could be done in the pages of the Front Page blog. Activity per entry or comment: whenever you publish a weblog post, or comment on one, an entry will be added to your activity feed so that your friends can see what you're doing. This will be implemented as a feature of a Roller-specific OpenSocial Gadget. Protected entries: ability to publish blog entries that are visible only to your friends via the Roller Gadget. Most of the above items should be pretty easy with the SocialSite widgets, but I'm sure I'll run into a snag or two at least. I always do. I'll post again next week and let you know how far I got.